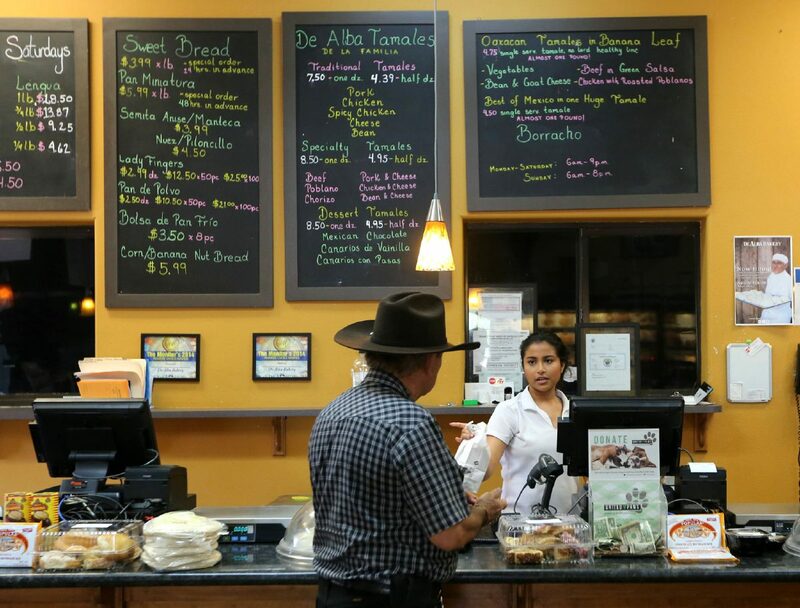 Danielle Reyes helps a customer with his purchase at De Alba Bakery Monday, March 26, 2018, in Pharr. 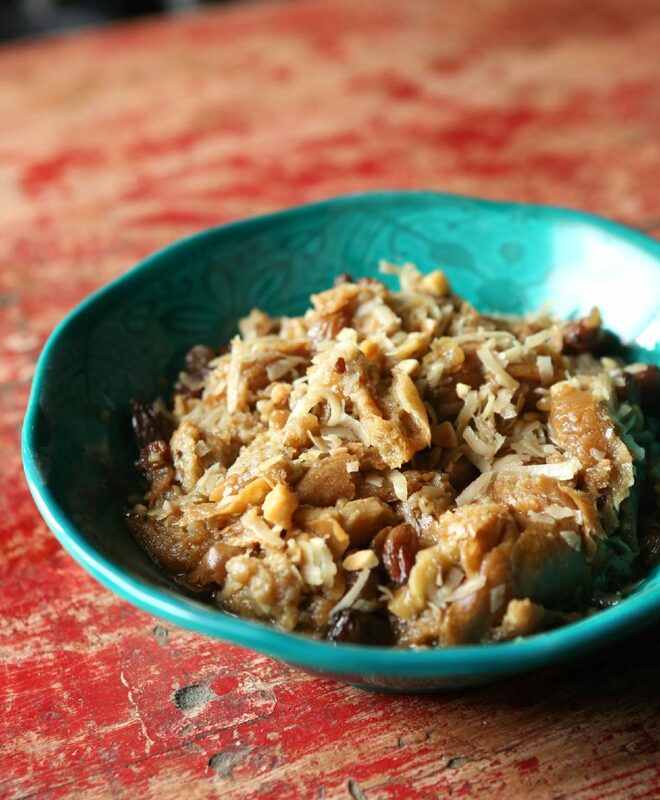 If the sacrifices of Christ believed by Catholics could be embodied into a single dish, Capirotada would be it. Capirotada de vigilia is a bread pudding made from a few key ingredients: stale bread, melted cheese, dried fruit, nuts or cloves and piloncillo—unrefined Mexican sugar. It’s known to have originated in Spain during the 1400s and has since taken on many variations between sweet and savory— sometimes including tomatoes and onions. Six centuries later, the vegetarian dish remains synonymous to Easter season in Hispanic culture. Baked in a large casserole dish, each layer is symbolic of the crucifixion and suffering of Christ. The bread serves as his body, the dark sugary syrup symbolizes his blood shed, cloves or dried fruit pieces echo the nails of the cross and the cheese cloaks the capirotada to represent the holy shroud. Capirotada, a bread pudding traditionally eaten by Catholics at the end of Lent, from De Alba Bakery Monday, March 26, 2018, in Pharr. A 12-ounce box of Capirotada sits on the counter with other goods at De Alba Bakery Monday, March 26, 2018, in Pharr. With Lent coming to an end on Friday, bakeries in the Rio Grande Valley have been gearing up to meet demands. 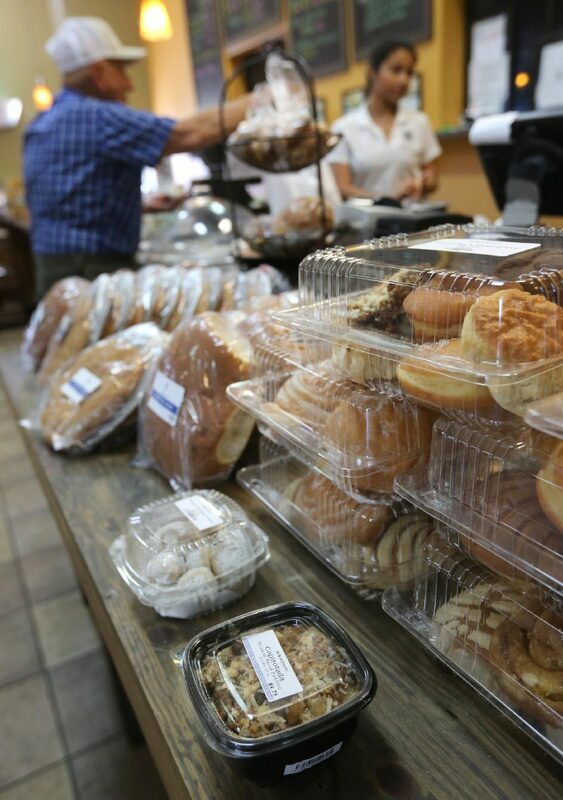 De Alba, a local bakery with three locations across the Valley, is no exception. Since first opening in 1959, it has existed as a popular spot for families to purchase their capirotada. According to De Alba Creative Director Luis Ochoa, more than 3,000 are sold every year. Each batch takes two-and-a-half hours to prepare and for those who prefer baking from scratch, De Alba offers a kit with step-by-step instructions and all components of the “family recipe” included. As a child, Ochoa recalls occasionally making a visit to the family operated bakery for an after-school treat. While his mother had her own recipe, he said, whenever the fasting season rolls around and capirotadas are pulled fresh from the oven, the wafting scents of cinnamon and cloves transport him back to the family tradition from his youth of enjoying the dish on Good Friday. In his time spent working for De Alba, he has witnessed customers return year after year for the seasonal pudding. Many share a story similar to his and now bring their own children. “We truly believe food is the glue that brings families together so we want to keep and maintain those traditions as much as we can,” he said. “It’s a very important time in the Mexican culture.